This well-organized, easy-to-search compendium of book reviewslast we checked, there were 1,430 titles coveredincludes editor's picks and bestseller lists by year. The site links to (and vets) dozens of literary weblogs, from Bookninja to Mobylives to its own Literary Saloon. 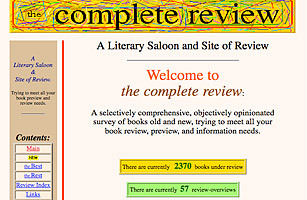 The Review Index lets you search for books by author or title, genre or nationality; you can read the site's own review or click to read reviews published elsewhere.